Brookhaven is a mid – sized neighborhood, moderately priced with many amenities. It is convenient to downtown Acworth, I-75, churches, shopping, schools and activities for your whole family to enjoy. Brookhaven is a neighborhood of traditional homes priced between $115,000 and $195,000 with covenants to protect your property values. Brookhaven has easy-care yards for the family on the go. Brookhaven has various amenities that are well designed for families. The amenities include a pool, lighted tennis courts and playground. The schools zoned for Brookhaven are Lewis Elementary, Awtrey Middle and Allatoona High School. The schools are part of the superior Cobb County School System! 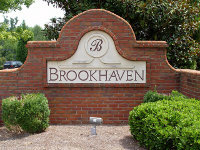 Brookhaven has a Homeowners Association that oversees the welfare of the neighborhood. Covenants protect your privacy and property values, which helps to keep the neighborhood clean and retain your investment value. Brookhaven is located in Kennesaw: 75N. Left on Chastain, Right on 41. Just before Lowes, make a right on Creel Chase.